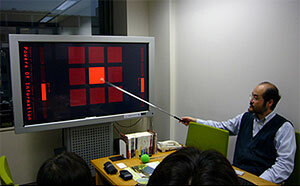 An explanation was given on the “Powers Of Information,” a touch panel-type digital archive, from Professor Takano Akihiko, Director of the Research and Development Center for Informatics of Associations at the National Institute of Informatics. On June 9, Tanaka Atsushi, Yamanashi Emiko, Tsuda Tetsuei, Nakamura Setsuko and Katsuki Gen’ichiro visited Professor Takano Akihiko, Director of the Research and Development Center for Informatics of Associations　at the National Institute of Informatics, and Project Associate Professor Marukawa Yuzo to exchange opinions about future efforts for the dissemination of related to cultural property. These two individuals were once involved in the establishment of “Imagine” and provided technical support for the launch of “Cultural Heritage Online,” a portal site operated by the Agency for Cultural Affairs. 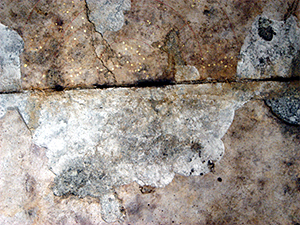 Advice from these two individuals who are also versed in the field of cultural property study were highly suggestive for those engaged in the construction of cultural property archives. 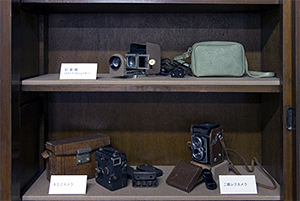 An Anthony camera is exhibited in the former research room on the first floor of the Kuroda Memorial Hall. Outdoor scenery is reflected upside down on the ground glass of the large-sized camera. 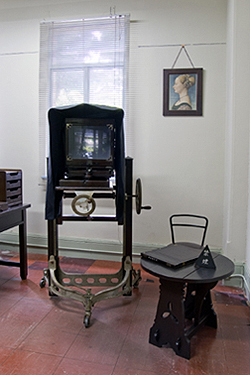 A slide projector, an 8 mm camera and a twin-lens reflex camera that were used by the predecessor of the Institute, The Art Research Institute, are also displayed. A large-sized camera that had been kept in the Image Laboratory of the Department of Research Programming has recently been completely restored and is being shown to the general public from June 5 in the former research room on the first floor of the Kuroda Memorial Hall. This camera is a studio camera modeled after a camera produced by E. & H. T. Anthony & Company in the United States and imported in the early part of the 20th century. The predecessor of the Institute, The Art Research Institute, used this camera from the time of its inauguration and early days until the post-war period in order to photograph art works and such for research. 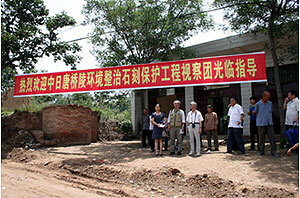 It also contributed to preserving many cultural properties in the form of recorded images. 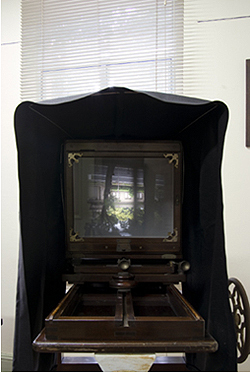 In this exhibition, the camera is displayed with its lens facing outside so that visitors can see the outdoor scenery reflected upside down on the ground glass. In addition, other optical instruments that were indispensable in research and investigation, such as an 8 mm camera and a twin-lens reflex camera manufactured in pre-war France, are exhibited. Moreover, efforts are now being made to preserve glass plate negatives photographed with such cameras. 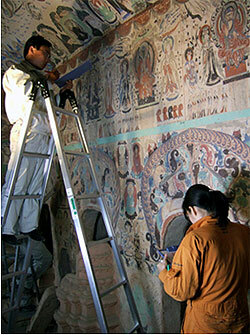 At the same time, their digitization is in progress so that they can be made public and contribute to research. This statement of mutual agreement is based on the agreement for research exchange between the Independent Administrative Institution, National Research Institute for Cultural Properties of Japan and the National Research Institute of Cultural Heritage of the Republic of Korea　that was concluded in 2005 and prescribes, in concrete terms, arrangements for research exchange in the field of intangible cultural heritage between the Department of Intangible Cultural Heritage of our Institute and the Folkloric Studies Division of our counterpart in Korea. 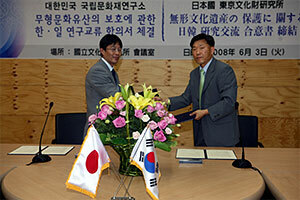 The agreement was concluded with signatures at the National Research Institute of Cultural Heritage, Korea on June 3, 2008. From now on, the two parties will exchange researchers, provide training and other programs and hold discussions to realize future collaborative researches in accordance with this agreement. It was also decided that the results of these undertakings would be published in the form of collected papers of the joint research at the end of fiscal year 2010. There was a lively exchange of opinions at the Post-Training Course. Once a year a post-training course is held for those who have completed the “Training Course for Museum Curators” in the past with the aim of conveying the latest topics regarding conservation of materials. 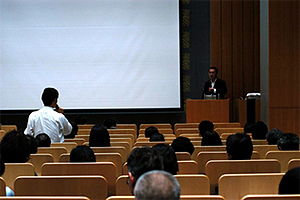 This fiscal year, the course was held on June 2. 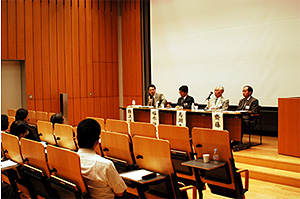 The following three topics were selected: indoor temperature and humidity analysis by means of computer simulation (Inuzuka Masahide), use of dichlorvos pesticide in conservation facilities for cultural properties (Yoshida Naoto) and the manual for museum conservators on preventing mold growth on cultural properties which the Ministry of Education, Culture, Sports, Science and Technology is in the process of compiling (Sano Chie). 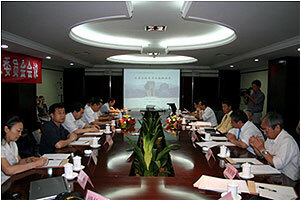 There was a lively exchange of opinions between the participants and members of the Department since the topics covered serious issues the participants face in the field, including the forecast of the conservation environment, pest control and preservation of materials as well as the prevention of health hazard to the staff. Sixty-six persons participated, a number which exceeded 10% of all those who have completed the Training Course during the past 25 years. We cannot help but feel the weight of responsibility resting upon us. We will continue to provide the latest information not only at such post-training courses but also by taking advantage of various opportunities. In the panel discussion, there was a lively debate on new interpretations regarding the manufacture of the triangular-rimmed bronze mirrors with mythical figure and animal designs. 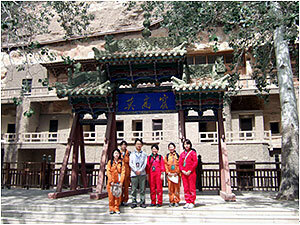 In preparations for the exchange program that has just started this fiscal year, we visited Mongolia from June 9 to 14. 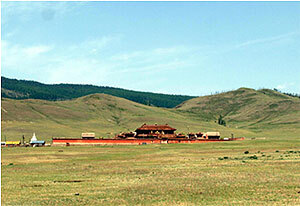 As part of this program, together with the Department of Intangible Cultural Heritage of the Institute, workshops related to the framework for the conservation of cultural properties including organizations and laws are being planned as are training programs to foster experts for the Center for Cultural Heritage of Mongolia under the Ministry of Education, Culture and Science of Mongolia. The meeting with the Director of the Department of Culture and Art of the Ministry was filled with a friendly atmosphere, and the Director readily agreed to the conclusion of a statement and memorandum of mutual agreement with the Institute upon inaugurating the project. We also inspected the Amarbayasgalant Khiid, one of the largest wooden structures of Mongolia located approximately 350 km north of Ulan Bator, the capital. This temple underwent investigations and restoration projects by Japanese experts dispatched through UNESCO from the early 1970’s to the mid-1980’s. However, it is poorly managed at present and an expert of the Ministry of Education, Culture and Science told us that immediate actions were required. We confirmed that there was not only damage to the color of the building and its roof but also that the structure of the temple was suffering deterioration. Through the discussionｓ at this meeting, the two countries have come to hold the wish to include building-related contents in the training program for experts that will be conducted from the next fiscal year on. 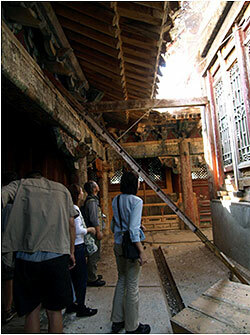 After our visit, we learned that demonstrations expressing dissatisfaction with the result of the election which had been held at the end of June led to a riot in Ulan Bator and that the mobs had set fire to the Center for Cultural Heritage, the counterpart of our Institute, resulting in damage to the building, equipment and cultural properties. We express our heartfelt sympathy to the staff of the Center. At the same time, we are seeking a possibility of emergency response by sharing information with the embassy and experts in related fields.